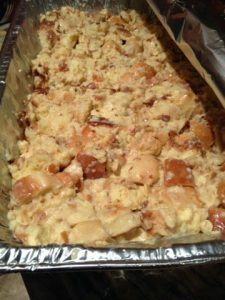 I love making this dessert when I have to bring something to a party or even making it for one of my HOLIDAY parties. It is very easy to make and can serve a HUGE CROWD. You can add sprinkle to the top to make it even more festive. Or add PECAN or walnuts. 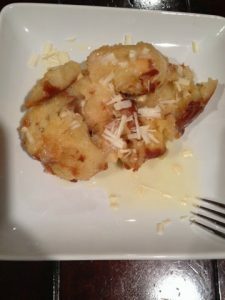 This is just a different spin to the regular BREAD PUDDING. 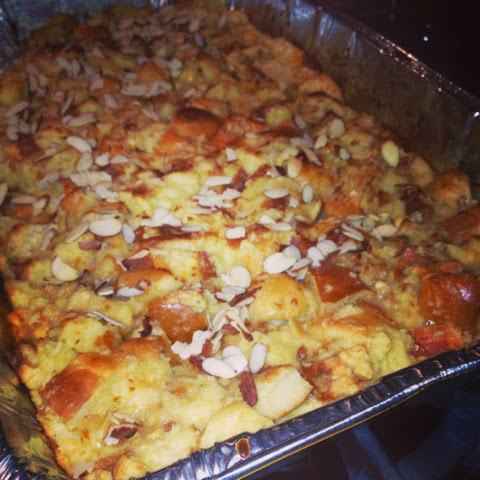 I LOVE BREAD PUDDING and this one is even better!!! In a huge pot add the cream, milk and sugar over medium heat. 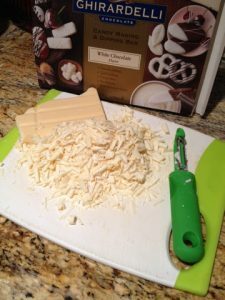 When its starts to boiled, take the pot off heat and add white chocolate pieces and stir until it all melted and incorporated. In another mixing bowl…combine eggs and egg yolks. Once the cream mixture is COOL…pour the egg mixture SLOWLY into the cream mixture. In a large BAKING PAN layer the bread. Next, pour the egg and cream mixture over the sliced bread. Using a spatula or big spoon..squish the mixture and bread down. Let the bread mixture settle for a little while before putting it in the oven. I usually let it sit for about 15 minutes. 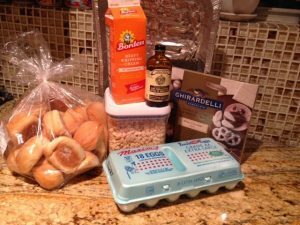 garnish with shaved chocolate and slivered almonds! !